I received a copy of this book from the publisher. This does not affect the content of my review. Well. That was just delightful. It's weird to say delightful because this book is about religion and being angry with God and cancer and I cried for the entire last 40 pages or so, but there it is. Delightful. Honestly, I don't think Emery Lord can write a bad book. She has become an auto-buy author for me, even though her books are very different. They are also very similar in that they make me feel things when I read, they are unapologetic in being pro-female characters, and they're just freaking good! I am not a fan of Christian fiction or any books that take a pro-religious point of view or try to share a moral. If I want that, honestly, I will just read my scriptures or whatever. However, I have been asking for YA books with religious characters in them since 2014. As a teen, I attended church several times a week. Every Sunday for regular service, every Wednesday for a regular program for teens. Often on Saturday during the day or evening for special programs like a church sports league, service project, or even a dance. And, because I'm Mormon, during high school I attended a class every Monday through Friday morning before school. I'm from the south so while my friends didn't attend my class, many of them attended church regularly on Sunday and Wednesday as well. Most Mormon kids have that weekday class, although in Utah, Idaho, and California, they might be able to go during school instead of before. And a lot of teens I know online include their faith even in their Twitter bios. Religion is a huge part of so many teens' lives! So why doesn't YA include more books with religious characters? Honestly, because it's hard to write a book that's not neutral about religion while containing religious characters. Emery Lord, writing unicorn fairy dragon that she is, has done exactly that. Main character Lucy does not shy away from her faith (although she does question it after her mother experiences a relapse with her cancer), but never does the book take a pro- or anti-religious stance. If you are worried that this book pushes a Christian agenda or that it will bash Christianity, let me assure you: it does NEITHER. The book features Lucy exploring her relationship with God and faith without passing judgment. I appreciate that so much, and I hope other authors will be inspired by The Names They Gave Us to create more stories with teen characters of all faiths. There are so many things this book does right. There's a great family dynamic between Lucy and her parents, and I like that there are moments with each of these three characters' "perfect" shiny veneer slips and we see they're gloriously human and not actually perfect at all. But I'm glad that an emphasis is placed on being honest with your family, even when it hurts. And though Lucy goes to a camp with troubled campers, the narrative never become the tired "these kids teach me more than I could ever teach them." Lucy works hard to help her campers, and while yes, her experiences help her grow into a better person and character, it's never manipulative. Lucy's growth occurs very organically and naturally, in slips and starts and setbacks. Also, there are just enough fun and sweet moments with friends and the cute love interest to balance out the heavy of the book. In a book where some of the main plot points include religion and cancer, this is desperately necessary to prevent the book from being a complete downer. I think Emery does a great job achieving this balance. The Names They Gave Us is also a book that includes an incredibly diverse cast. One of Lucy's new camp friends is trans and has anxiety, and the conversations Lucy has with her are so so very important. There's also an interracial romance, and although Names doesn't go as in-depth as Ramona Blue about the challenges black boys face, especially when in a relationship with a white girl, Jones does talk about it some. One of Lucy's new friends at camp is trans, and although I can't speak to the representation of that character, I do like that there are frank conversations between Lucy and Anna about being transgender. I fucked up my friendship with the first trans person I ever knew because I didn't know how to be his friend during/after transition (I know that is a truly terrible thing to say. I KNOW.) so I appreciate any writer who tackles these heavy conversations with grace and a firm hand (Anna doesn't hold back when Lucy says something hurtful). Anna also has extreme anxiety that is discussed on the page. There are characters with different kinds of families, and teenage pregnancy is explored, including discussing adoption. 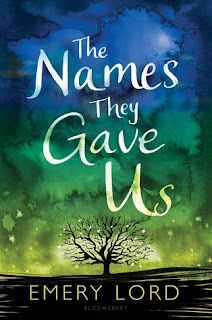 The Names They Gave Us is a beautiful book, and it fills a void currently present in YA lit. Emery's writing is so lovely, and I think she masterfully crafts a story inclusive of many different people as well as life's various twists and turns. This is the kind of book that feels real to me. The characters and situations are presented so well and with great care and attention to detail that everything feels very three dimensional, not flat or even fictional. While reading Names, I felt like Lucy, her family, and her friends were real people I could meet if only I visited Camp Daybreak. This book made me feel deeply (again: I cried for 40 pages straight) and it made me think critically about my own life, and I can't ask for more than that. More books like this, please! EEK so sadly I was NOT a fan of this just because I did not click with the characters and I felt it tried too hard to be different to the point where it felt the exact same for me! Glad to hear you enjoyed it though! I'm sorry to hear it wasn't to your liking, Anisha! Any book is going to be hit or miss with readers. This one just really resonated with me, and I have a feeling it will with other readers as well. I really like books that feature characters who are religious (perhaps because I'm not!) and have read some great ones lately: Saints and Misfits, That Thing We Call a Heart, and this book. I had other concerns about the illness themes in this one. (I'm just really tapped out on books with serious illness.) I peeked at the ending, decided not to read it, then relented and read it. I agree with what you say - I thought the strength of this book was the openness and compassion in the way it portrayed all the characters. The ending is the reason I can't find it in me to give it that last half a heart for a perfect rating. I definitely prefer my fictional endings a little more concrete, but I understand what Emery is trying to accomplish by leaving it more open to interpretation. I'm VERY interested in Saints and Misfits, and I'm glad to hear you loved it! I'll have to check out That Thing We Call a Heart as well. I just added this to my wishlist. I like to read Christian fiction because it's usually clean with very little profanity, steamy scenes, etc. Church camp was a big part of my life as a teen, so that part would resonate with me. Thanks for sharing, I hadn't heard of this title before. I hope you like it! Also, there are some great titles that aren't necessarily Christian fiction that don't have strong language or sexual content; it just takes a little bit of research. I am so excited to find out that this book has a religious character! I think too many authors shy away from it, afraid of alienating their readers (or maybe the publishers). I love that this book stirred up so many emotions and can't wait to read this book. I think it's just really hard to create a realistic religious character without being offensive so I understand why most authors don't include religion more often, but I thought Emery did an amazing job. SO good. You should absolutely give her backlist a shot. Open Road Summer is my favorite!